The gaming world has become a lucrative industry over the last few decades, spawning multiple different sub-industries like VR gaming, MMORPG gaming, and even professional competitive gaming. Teams of young gamers can travel the world, playing the games they love against teams from other countries, and they can make a living doing so. Things have really changed since Pong first entered our homes. It used to be that, in order to play video games together, you had to either own your own system and invite someone over or you had to go to a friend’s house to play. Additionally, play was usually limited to two players at a time, later expanding to four, meaning that if you had a party and wanted to play games together you couldn’t all play at the same time. One of the biggest gaming industries to really take off in the last decade has been the world of massive multiplayer online role-playing games (MMORPGs). Online RPGs make it possible for friends in any location, in any number, to play together. Popular games like Fortnite or World of Warcraft connect players around the world together in a collaborative storytelling effort unmatched by other gaming designs. Additionally, the monetization models for games like these are endless. There are many factors that have contributed to the growth and success of MMORPGs — like the age range of the majority of player demographics and the increased accessibility of gameplay through mobile devices. Perhaps the most compelling factor is the immersive character opportunities that MMORPGs present. Players aren’t only entertained when they play — they get a chance to escape reality and become their fantasy warrior or wizard self. The most popular MMORPG currently on the market is World of Warcraft with more than 5 million subscribers. The game initially launched in 2004, with continual developments and updates ongoing since then, and it truly rocked the gaming market. The game combines narrative elements with the collecting of digital objects and player leveling. Traditional RPGs have focused on these elements in the past, but MMORPGs provide the opportunity to level and collect items together. The team element makes it possible for players to level more efficiently and find more rare items simply by the benefit of having help. Playing together in “hordes” or “guilds” can build a sense of community that keeps players returning to the game over long periods of time. 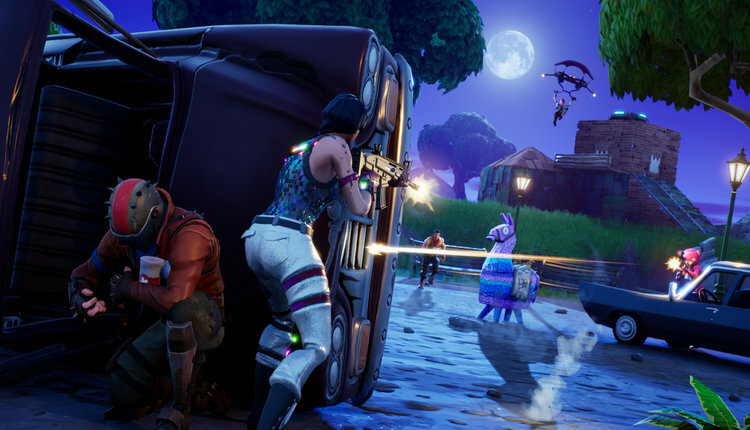 Although Fortnite isn’t an MMORPG the Battle Royale genre has its similarities to MMORPGs, not least in player numbers. Source. While the gameplay itself shifted what players were looking for in their games, majorly successful MMORPGs like World of Warcraft have also impacted the ways that development teams come together. A game with “massive” in the title requires an expected amount of resources, and that includes ensuring the teams building the game are equipped for the development required. Development teams for an MMORPG may include upwards of 200 members, many of whom have a master’s in software development. These teams will work together to simultaneously provide new narrative material for players to engage with while ensuring that any bugs, patches, errors, or updates are handled in a timely and seamless manner. They have to do the same work as developers of a typical retail game but in a continuous manner. This environment of rolling deadlines and demands makes working on an MMORPG team especially challenging — which can be fun for those so inclined. Another huge development in connecting gamers together through MMORPGs has been the increased access and success of mobile gaming. Currently, 68 percent of all Americans own a smartphone, and for all the hours they spend on it, they spend 43 percent of their time playing games. While the internet and computers have increased the number of people playing online together, mobile gaming has made access to gaming together even more accessible. Much like MMORPGs have monetization models where players can buy upgraded armor, or even in some cases pay to level up, mobile RPG apps frequently follow the “free to play” model. This means players can play through the game, but some items and upgrades will cost small amounts of money. A few dollars here or there from millions of players all over the world adds up to keep app games successful. It’s worth noting that even though players may be engaging with mobile RPGs on a smaller screen, the graphics and development of the games haven’t fallen by the wayside. Games like Arcane Legends or HIT offer fully developed and visually stunning graphics comparable to those displayed on console systems. Provided players can access Wi-Fi with their phone for the initial download, they can have the same MMORPG experience as their peers playing on a computer — simply with different game titles. However, there are some MMORPG games that have gone cross-platform, enabling players to interact with one another across devices. Old School Runescape is one such title. Runescape was a popular MMORPG from the early 2000s, and recently the company launched a mobile version for Android. With more advanced technology, the gaming industry can explore new avenues for interactive and community storytelling. Much like the internet enabled players to play together regardless of location, and mobile gaming allowed players to play from anywhere, new developments in tech will give gaming a whole new experience. For example, VR gaming has just begun to take off. Most consumer titles for VR systems are closed-world RPGs or first-person shooters. While there are VR social platforms or communities where people can talk with one another, there aren’t many ways in which the community aspect and the gaming aspect are linked together. The first title to try and create a VR MMORPG is Orbus VR, which launched this year and is only in the early access stage of development. Orbus VR provides some of the more team-oriented elements of MMORPGs, like dungeon crawls and boss battles, all in a VR capacity. Interestingly, the site claims that players can hang out in a simulated chat environment to simply socialize together, a feature not exactly found in other MMORPGs. These are just a few of the possibilities presented with VR and MMORPGs — the next developments can only bring great things.